Well gentle readers, it's been awhile since my last post, but now that 2018 is here, I'm ready to roll! 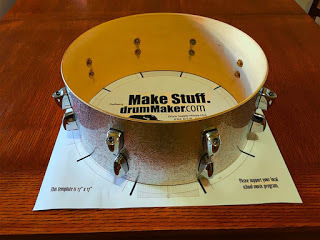 Being an artist, and a man who likes to work with his hands, I’ve managed to build more than a few drum kits from scratch, as well as several snare drums. To date, I’ve restored 2 vintage 14” x 5.5” Gretsch maple snare drums; a 14” x 5” Ddrum birch snare; a Yamaha 14” x 6” Mahogany Rock Tour snare; and a 14” x 5.5” Mapex maple snare drum. Finding parts on ebay, adding new wraps from Jammin’ Sam in Arizona, and new Evans drum heads have breathed new life into these aged beauties. Cobham’s Yamaha Signature snare was a 14" x 6", 6 ply maple drum; That’s thinner than most snares and not particularly easy to find, as most Keller VSS shells come in a thicker or thinner ply, like 5, 7, 8, or 9, and smaller or larger depths, like 14” x 5.5”, or 14” x 6.5”. 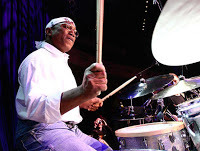 Fortunately both drumMaker and Precision Drum could make them to order. 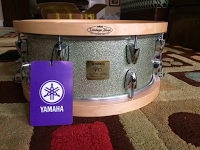 I'd already converted my 14" x 6", 8 Ply Yamaha Rock Tour snare to resemble Cobham's black snare, with Gibraltar wood hoops, faux Yamaha taillight lugs from WorldMax, and a basic Yamaha strainer. 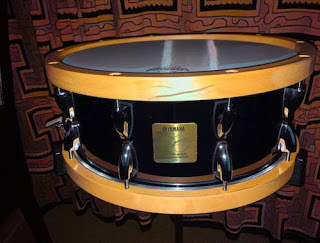 It sounded good, but it wasn't in the same league as a real Cobham snare; For one thing it was an 8 Ply drum; 6 Ply Mahogany with 2 Ply Ash, and had 10 lugs instead of 8. I had recently recorded a few tunes with it at 25th Street Recording in Oakland, and as nice as it was, I could tell it wasn't a maple snare. 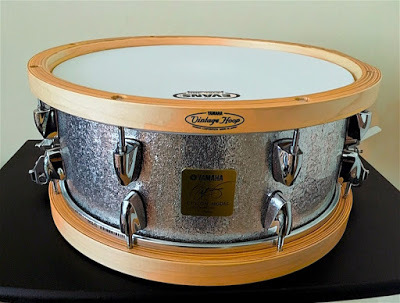 I needed a snare that was more versatile; I needed the warmth, the sustain and the depth that could only come with 6 Ply maple using the best Yamaha parts.